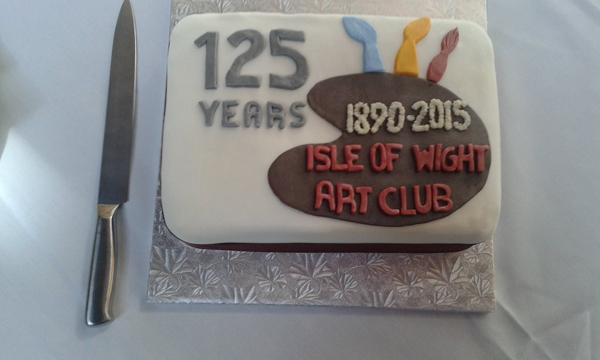 In 2015 the Isle of Wight Art Club celebrated its 125th anniversary. The first recorded event in the club’s history, then known as The Isle of Wight Art Society, was the presentation of a folio of paintings to a local notary and Honorary Secretary of the Society, Sir William Levinge in 1890. After the First World War the Society changed its name to The Isle of Wight Art Club. The Club has always enjoyed a mix of professional and leisure painters and has had several distinguished artists as members including Alwyn Williams, Founder and President of the Royal Society of Miniature Artists, Cavendish Morton RI and Muriel Owen, one time Vice-President of the Society of Women Artists. Today, the professionals are always ready to share their expertise with other members at the club’s weekly meetings, which are held at various outdoor locations on the Island in the summer, and in the Riverside Centre in the county town, Newport, throughout the winter months. Indoor meetings always include the opportunity for members to paint portraits of sitting models and arranged still-life. We also enjoy frequent demonstrations of working in various media and arrange trips to visit important exhibitions on the mainland. It has always been the purpose of The Club to provide opportunities for members to show their work. Catalogues of exhibitions held since the early 1930s have been preserved along with press cuttings, which often describe the exhibits in detail. For many years, sculpture and craftwork were included in these exhibitions but, today, only paintings are shown. For many years, Queen Victoria’s daughter HRH Princess Beatrice was President of The Club and often showed her own paintings in the exhibitions.